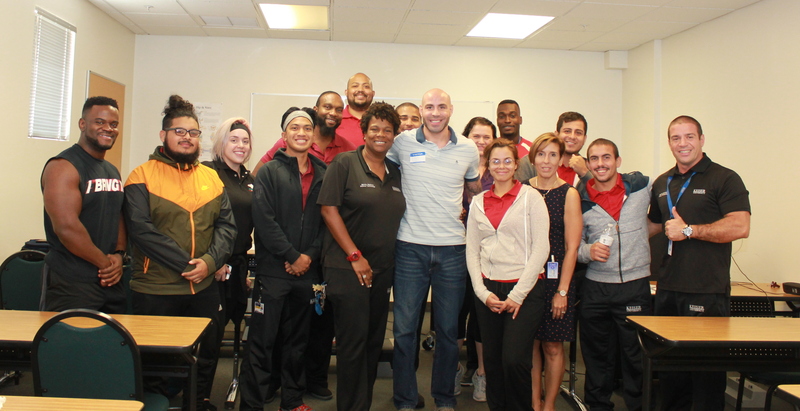 Exercise Science students at the Orlando campus enjoyed guest speaker Ben Saunders, professional fighter in the UFC Welterweight division. Mr. Saunders spoke on mental preparation and psychological factors that can affect athletic performance, giving the students of the sports psychology class and the rest of the exercise science department, a firsthand account of how a high-level athlete can train and stay focused through personal and professional challenges, remaining positive and clear in their goals. Mr. Saunders has been fighting professionally since 2004, and has been a featured fighter on the Ultimate Fighter and has also fought in Bellator. Currently, he trains and fights out of American Top Team Orlando, and holds 21 wins.